Hunger now scars the lives of over 1 billion people -- a new record. Today, Monday the 16th, world leaders will gather at a UN food summit in Rome to debate what to do about it. As a former Goodwill Ambassador for the World Food Program, I sense how the meeting may go. There will be more media attention on the politicians than on the issues, an abundance of speeches, and a series of oddly fancy luncheons -- with more speeches. At a similar luncheon, I remember wondering: What if I could magically transfer the 1000 calories in this vanilla souffle in front of me to a malnourished child begging in the slums of Nairobi? Sharing the extra calories eaten in the United States or Europe alone would end hunger in Africa. These gratifying fantasies highlight some terrible inequities in how the world handles its food supply. In 2006, the World Food Program produced, but never publicly released, a map charting food consumption. 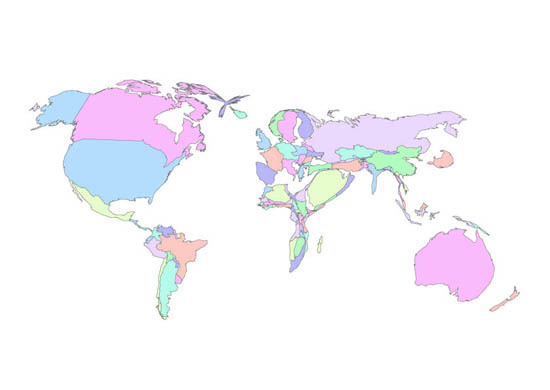 Dubbed the "Fat Map," it shows where the world's calories go. Nations grow or shrink based on how much the average person eats. Depending on your perspective, it maps starvation or overeating. The mis-distribution of food goes deeper than even the "Fat Map" implies. In India, for example, more than 300 million overweight people coexist with another 300 million who starve. Chronic diseases like diabetes and heart disease that often stem from overeating are growing at a far faster rate in developing countries than in the more prosperous West. In my own region, the Middle East, obesity is skyrocketing, especially among young people. In 2007-2008, a global food crisis surprised us as prices soared. But would the crisis have been as severe if we were not so accustomed to wasting the food we have? Globally we are moving to an "energy morality" with young people lobbying against wasting energy -- yet there is no "food morality" even though food is organic energy. We sit by and watch each other overeat and discard food without a thought. Extravagant overindulgence is viewed as hospitality and many assume that being a good parent requires that we force feed those we love. We pay dearly for this overconsumption. Recent calculations set obesity-related health spending just in the United States at $150-$200 billion -- more than all foreign aid worldwide. The cost of extra medical care for the obese runs as high as $1400 per person annually. Over 2 billion people do not earn that much in a year. Food losses are another reflection of our embrace of excess. Each year, food waste costs the average Briton over 400 UK pounds per year, while US households lose or discard 14 percent of their food. America's supermarkets and restaurants discard another 27 million tons. Adding farm and wholesale losses brings the annual bill to over $100 billion just in the US. Similar figures would, no doubt, emerge from analyzing losses in the European Union and I suspect the Gulf States as well. While initiatives emerge to tax unhealthy food, improve nutrition education and label foods to show the carbon footprint required to produce them, there is no broad public embrace of the need to eat less and eat responsibly. Retailers and restaurants still sell food in portion sizes and packages encouraging excess eating and waste. It is time to recognize the energy, health, and productivity losses we incur from consuming and wasting so much food. Public health campaigns worldwide -- including in the Gulf States -- now promote the message that excess weight and lack of physical activity is linked to heart disease, type 2 diabetes, strokes, and some types of cancer. Is anyone listening? Well, after years of increases, the Center for Disease Control in the US found that levels of obesity have finally begun to level off. Would cutting overeating and waste really change the contours of the "Fat Map"? Not by itself. The UN estimates we need $30 billion more invested in agriculture yearly. But each of us can consume more wisely and donate food we now waste to a food bank or charity. If it makes sense to save energy, why throw away billions of dollars worth of food and overeat until it endangers our health and our future?